"Fat Man" was the codename for the nuclear bomb that was detonated over the Japanese city of Nagasaki by the United States on 9 August 1945. It was the second of the only two nuclear weapons ever used in warfare, the first being Little Boy, and its detonation marked the third nuclear explosion in history. It was built by scientists and engineers at Los Alamos Laboratory using plutonium from the Hanford Site, and it was dropped from the Boeing B-29 Superfortress Bockscar piloted by Major Charles Sweeney. 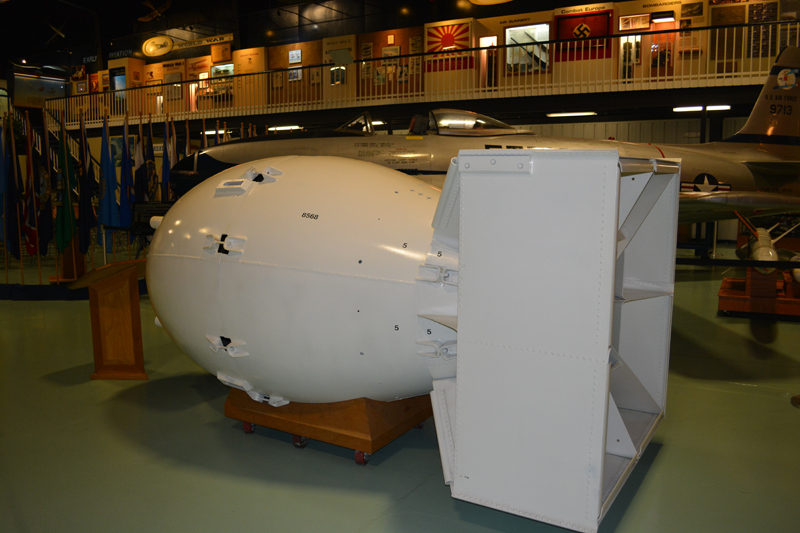 The name Fat Man refers to the early design of the bomb because it had a wide, round shape; it was also known as the Mark III. Fat Man was an implosion-type nuclear weapon with a solid plutonium core. The first of that type to be detonated was the Gadget in the Trinity nuclear test less than a month earlier on 16 July at the Alamogordo Bombing and Gunnery Range in New Mexico. Two more were detonated during the Operation Crossroads nuclear tests at Bikini Atoll in 1946, and some 120 were produced between 1947 and 1949, when it was superseded by the Mark 4 nuclear bomb. The Fat Man was retired in 1950. Robert Oppenheimer held conferences in Chicago in June 1942, prior to the Army taking over wartime atomic research, and in Berkeley, California, in July, at which various engineers and physicists discussed nuclear bomb design issues. They chose a gun-type design in which two sub-critical masses would be brought together by firing a "bullet" into a "target". Richard C. Tolman suggested an implosion-type nuclear weapon, but the idea attracted scant consideration. The feasibility of a plutonium bomb was questioned in 1942. Wallace Akers, the director of the British "Tube Alloys" project, told James Bryant Conant on 14 November that James Chadwick had "concluded that plutonium might not be a practical fissionable material for weapons because of impurities." Conant consulted Ernest Lawrence and Arthur Compton, who acknowledged that their scientists at Berkeley and Chicago respectively knew about the problem, but they could offer no ready solution. Conant informed Manhattan Project director Brigadier General Leslie R. Groves Jr., who in turn assembled a special committee consisting of Lawrence, Compton, Oppenheimer, and McMillan to examine the issue. The committee concluded that any problems could be overcome simply by requiring higher purity. Oppenheimer reviewed his options in early 1943 and gave priority to the gun-type weapon, but he created the E-5 Group at the Los Alamos Laboratory under Seth Neddermeyer to investigate implosion as a hedge against the threat of pre-detonation. Implosion-type bombs were determined to be significantly more efficient in terms of explosive yield per unit mass of fissile material in the bomb, because compressed fissile materials react more rapidly and therefore more completely. Nonetheless, it was decided that the plutonium gun would receive the bulk of the research effort, since it was the project with the least amount of uncertainty involved. It was assumed that the uranium gun-type bomb could be easily adapted from it.